Indeed, Momaday is proudly and unpretentiously in his element here as a storyteller, artist, and educator of international renown—a poet and Pulitzer Prize–winning novelist, as well as a playwright, essayist, professor, painter, photographer, and more. Surrounded by paintings and prints by such notable Indian artists as Fritz Scholder, his late father, Alfred Momaday, and others, plus archival photographs of his Kiowa forebears, he reveals himself as a connoisseur of art and history. More readily, he reveals his roots in the Kiowa oral tradition, an art and history largely unwritten until Momaday took up the task. He is a virtuoso of the spoken word, accepting a visitor’s questions as invitations to exploration—of language, identity, and, ultimately, story. “Ah,” he says often, “there’s a story in that.” Momaday’s sonorous voice, for which he is fittingly famous, alternates with authority and awe of his subjects, engaging his listener with dramatic inflection and tone. He is charismatic, funny, graceful, gregarious, polite. Even while seated, his presence is powerful. That voice first echoed across America in 1969, when, at 35, he won the Pulitzer Prize for fiction for his 1968 novel, House Made of Dawn. Of Kiowa and Cherokee descent, he was the first Native American to win the prize. His story of Abel, the broken World War II veteran who returns home to the ancient pueblo of Walatowa in search of healing, gained Momaday overnight acclaim for prose that, a New York Times reviewer wrote, was “as subtly wrought as a piece of Navajo silverware.” At a time of widespread civil unrest in the United States, the book offered valuable cultural and social insights into the struggle of Native peoples to exist in both the Native and non-Native worlds. Momaday was declared the premier Native writer of the 20th century. Some five decades later, many of Momaday’s 12 books—including poetry collections, essay anthologies, novels, memoirs, travel literature, and children’s stories—have been translated into French, German, Italian, Russian, Swedish, Japanese, and Spanish. His teaching, speaking, research, and activism have taken him from Santa Fe to Siberia. His plays have been performed at the Kennedy Center and beyond, his paintings and drawings exhibited internationally. He has received the 2007 National Medal of Arts; the Unesco Artist for Peace Award; the Premio Letterario Internazionale “Mondello,” Italy’s highest award for literature; and countless other national and international distinctions. And he is widely credited as the pioneering force in the so-called Native American Renaissance of Indian writers, scholars, artists, and political activists who followed his course. Palmer’s film charts the trajectory and impact of Momaday’s life and art both inside and outside the world of the Kiowa, an Oklahoma tribe of some 10,000 people with ancestral roots on the Great Plains. With its rich history of art and oral tradition, Momaday looms large in Kiowa culture. The bear came to kill them, but they were just beyond its reach. It reared against the tree and scored the bark all around with its claws. The seven sisters were borne into the sky, and they became the stars of the Big Dipper. In the summer of 1934, six-month-old Navarro Scott Momaday traveled with his parents to Devils Tower in the Black Hills of Wyoming. Rising 1,200 feet into the sky, the great black monolith that the Kiowa call Tsoai (Rock Tree) is believed to have grown out of the tree stump where the sisters fled when their brother became a bear. Not long after, back in Oklahoma, the storyteller Pohd-lohk (Old Wolf) came to the arbor of the family home on Rainy Mountain Creek, which the infant child’s paternal grandfather, Mammadety (Walking Above), had built in 1913. Pohd-lohk lifted the boy, son of Huan-toa (War Lance), and his wife, Natachee (Indian Moon), skyward. He spoke of how it was that everything began, of Tsoai, and of the stars falling or holding fast in strange patterns on the sky. And in this, at last, Pohd-lohk affirmed the whole life of the child in a name, saying: Now, you are Tsoai-talee—Rock-Tree Boy—forever fixing the child in the embrace of his people’s ancestral landscape. He was raised near Mountain View, in the area of Rainy Mountain, along the abundant waters of its descendant creek, both prominent landmarks for the Kiowas on the southern plains. In the early 1700s, the nomadic tribe had left the northern headwaters of Montana’s Yellowstone River, traveling east to the Black Hills of South Dakota and into the high plains, finally settling in the Wichita Mountains of southwestern Oklahoma. For over 100 years, they roamed the southern plains, gaining stature as fierce hunters, warriors, and horse people, tending great herds of buffalo in a culture steeped in mythology and the spirit of the Sun Dance religion. But in the mid-1800s, the U.S. Cavalry bound their free-ranging ways, restricting them to individual homesteads. While the Kiowa and their allies, the Comanche, were the only two Plains tribes not removed to reservations, the Kiowa culture was quashed. The buffalo were slaughtered, the Sun Dance rituals banned. The only thing left was the story. Huan-toa, commonly called Alfred, spoke fluent Kiowa, but Momaday was raised speaking English, the language of his mother’s Virginia and Kentucky lineage. Natachee Scott was raised a proper Southern belle, but in the late 1920s, she placed a feather in her hair, wrapped a blanket around her core, and claimed the Cherokee heritage of the great-great-grandmother for whom she was named. Soon after, Natachee married Alfred, who had changed his surname, Mam-madety, to Momaday. Alfred was a watercolorist in the tradition of the early-20th-century Kiowa Five, known for developing Native American easel painting with boldly graphic depictions of Kiowa ceremony and dance. Natachee wrote poetry and juvenile fiction, most notably the 1965 Owl in the Cedar Tree. 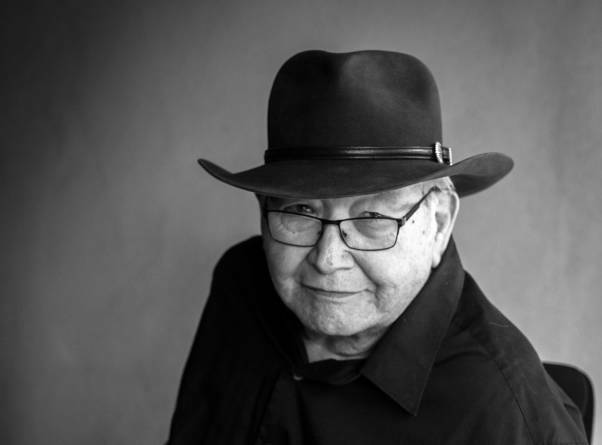 “I grew up in a very creative household, and I think that determined my life in many ways,” Momaday says. Both were also teachers, and as they embarked on a life together, they sought space for their only son to learn and create. There is a great red mesa, and in the folds of the earth at its base there is a canyon, the dark red walls of which are sheer and shadow-stained; they rise vertically to a remarkable height. You don’t suspect that the canyon is there, but you turn a corner and the walls contain you; you look into a corridor of geologic time. TIME AND SPACE SHIFTED AGAIN for Momaday in autumn 1946, when he came to live at Walatowa—Jemez Pueblo. Momaday’s birth, in the midst of the Great Depression, had long sent his parents searching for work. Over time, they took odd jobs in various towns on the Navajo Reservation. Then, during World War II, they moved to Hobbs for war-related work.Finally, they found permanent employment at the Jemez Day School. They would be its only two teachers for the next 25 years. Life at Jemez was poetry in motion. I had somehow got myself deep into the world, deeper than ever before, he wrote later. Around me were all the colors of the earth that I have ever seen. There were long gravel roads with coyotes and roadrunners racing beside them. There were tortillas and chile, and his favorite, posole. There were Native dances, Catholic ceremonials, and elders of wise bearing. There were rambling rides through red canyons on his strawberry roan gelding, Pecos. There was even a poet, the noted New Mexican priest and author Fray Angélico Chávez. In 1959, after graduation, marriage to his first wife, Gaye, and a year teaching oral English to Jicarilla Apache students in Dulce, Momaday snagged a creative writing fellowship at Stanford University. For four years, he studied American poets—including Emily Dickinson, Wallace Stevens, Hart Crane, and Frederick Goddard Tuckerman—and the English poetic forms—iambic pentameter and rhymed verse—that still influence his work. He then took his first teaching post at the University of California, Santa Barbara. But not long after arriving, the dedicated poet took a life-changing detour. “I had written myself into a corner with poetry,” he says. “I felt I needed more elbow room, because poetry is a very concentrated activity.” And so, in this way, with these words, Momaday began his story again: Dypaloh. There was a house made of dawn. It was made of pollen and of rain, and the land was very old and everlasting. Momaday needn’t have worried. In 1969, with publication of The Way to Rainy Mountain, the author’s star rose higher. House Made of Dawn had been set in familiar Jemez territory, but The Way to Rainy Mountain took Momaday into unknown and sacred terrain. Once in his life a man ought to concentrate his mind upon remembered earth, he wrote, layering Kiowa history and folklore with personal memoir. The book took the author back to Devils Tower, along the Kiowa migration route from Montana to the southern plains, and finally back to the arbor at the family homestead where Pohd-lohk had bestowed his Kiowa name. With his father serving as his translator, Mom-aday met the keepers of the Kiowa culture, those who had stayed at Rainy Mountain and preserved the oral tradition. Now, in the place where they had been and were still spoken, the stories rose to meet Momaday like old friends. In one afternoon with Ko-sahn, the only time he would ever see her, Momaday’s confidence in the connection between language and culture was reaffirmed. Ko-sahn’s voice and gestures and laughter, combined with his father’s skilled interpretation, authenticated his belief that language, like a long life, is a miracle. THERE WOULD BE MANY other stories, written and spoken, many other adventures at home and abroad. In faraway places like Moscow, where Momaday taught literature at the state university and became so lonely he instinctively started to paint. Or among the indigenous Khanty people of western Siberia, where he helped revive an old and dying bear festival, ensuring its passage to future generations. Today, a tree in western Siberia has the name “Momaday” carved deeply into its trunk. The Siberia project was an initiative of the Buffalo Trust, the nonprofit foundation Momaday founded with his late wife, Barbara. Its mission is to help indigenous peoples, especially children in crisis, hold on to their traditional values and cultural identity. One of his latest undertakings, intended to revitalize and benefit the trust, is closer to home. The project, a hand-printed broadside of Momaday’s 1976 poem “Forms of the Earth at Abiquiu” pays tribute to one of the author’s own creative icons, Georgia O’Keeffe. Momaday collaborated on the edition of 75 broadsides with Thomas Leech, director of the Press at the Palace of the Governors, part of the New Mexico History Museum. Leech printed the poem on handmade paper that he colored in the deep red hue of Abiquiu clay. Each is finished with a hand-colored sketch by Momaday of O’Keeffe as he remembers or imagines her. In the small study where Momaday sits to color the broadsides, a visual sweep of his success in the Native and non-Native worlds is on view. At one extreme are large-scale photos of his parents and paternal grandparents, clad in elaborate Indian garb. On the other are his delicate line drawings of O’Keeffe. A certificate of recognition from the Western Writer’s of America Hall of Fame underscores his influential roots in the West, while his own photographs from Russia reflect an equally significant role as a global explorer. On an open desktop, not one but three wide-brimmed hats rest side by side, waiting, perhaps, for Momaday’s next explorations amid the radiant geography of story—remembered, imagined, and real.